Movie soundtracks were big business in the 1980s - and so was the artist behind a film song that was the highest debuting single on the ARIA chart this week in 1989. It wasn't just a song from any old movie, but the first in a series of comic book adaptations that would be massive box office hits over the next couple of decades. The performer in question, Prince, was no stranger to soundtrack work. Some of the biggest singles of his career have come from movies and he sometimes even starred in the films as well - although, like Madonna's screen output, those films were often nowhere near as good as the accompanying soundtracks. In this case, Prince only provided the music for the blockbuster and the closest he came to featuring in the film was playing dress-up in the music video for his chart entry. At number 1 for a second week this week in 1989 was Swedish duo Roxette with "The Look", ensuring Kate Ceberano's "Bedroom Eyes" stayed put at number 2 for yet another week (the fourth of six weeks in the runners-up spot). Julian Lennon: rock god? Not quite, but this follow-up to "Now You're In Heaven" was one of the rockiest things he'd done. Well, rocky in a Richard Marx kind of way. The song was a resounding failure - even in Australia, who'd been far more generous to "Now You're In Heaven" than any other country. And, I can't help but think that although there's a decent chorus in there, it gets swamped by all the extra "rock" production which was added to the Patrick Leonard-produced album version for the single remix. A few weeks ago, five dance tracks shared the Single Of The Week slot on the ARIA singles chart - and "Manchild" is the fifth and final one to discuss, since it finally appeared as a breaker this week in 1989. In fact, the second single from Raw Like Sushi would feature as a breaker well into August, never quite managing to live up to the hype generated by "Buffalo Stance". As with that debut single, Neneh and her soon-to-be husband, Cameron McVey (aka Booga Bear), were listed as co-writers of "Manchild" - although this time around they collaborated on the track with Massive Attack's 3D (Robert Del Naja). The song became Neneh's second consecutive top 5 hit in the UK, and I can't help but think she was a little too ahead of her time as far as Australia was concerned. Despite what the chart positions of Jenny Morris' debut album and its accompanying singles (none of which breached the top 10) might suggest, the Body And Soul project had been pretty successful in Australia - with the album going platinum, and tracks like "You I Know" and "You're Gonna Get Hurt" receiving decent radio play. The New Zealand-born singer and former INXS backing vocalist stepped things up a notch with second album Shiver, which would sell three times as many copies and finally give her a top 10 hit - but not with lead single "Saved Me". Co-written with album producer Andrew Farriss (of INXS), the song had a bit of a world music feel, which was enhanced by the Richard Lowenstein-directed film clip that Jenny shot in Nicaragua. With Countdown off air and his segments on Hey Hey It's Saturday not taking that much of his time, Molly Meldrum kept himself busy with his record label, Melodian, to which he'd signed this pop quartet originally from Brisbane. Essentially a "boys in a band" act (my term for a boy band that plays instruments), Indecent Obsession were always going to find gaining support outside their teen demographic difficult - and indeed, it was more likely to see lead singer (and future Home And Away star) David Dixon smiling back at you with all those teeth from the pages of Smash Hits than to hear "Say Goodbye" on FM radio. Still, the song hit the top 10 and a new teen phenomenon was born. I had a bit of a love/don't get relationship with Prince in the '80s. 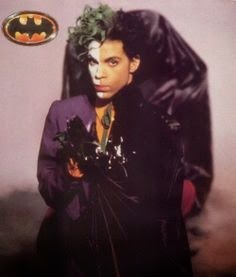 I loved tracks like "Raspberry Beret", "Glam Slam", "Alphabet St", "1999" and "Let's Go Crazy", but this single from Prince's soundtrack to Batman definitely fell into the don't get pile. To me, it sounded like a mess - so it's not surprising that as well as effectively being two different songs (one fast and frentic, one slow and seductive), "Batdance" was cobbled together from bits of other songs Prince had been working on. Throw in some dialogue snippets from Batman and it made "Pump Up The Volume" seem traditional. Still, plenty of other music fans got it, with "Batdance" becoming Prince's biggest Australian hit since 1986's "Kiss" and his fourth US number 1. Next week: the debut of a UK band named after an American state and the top 20 return of an Australian artist often mistakenly referred to as a one-hit wonder. Speaking of one-hit wonders, I'll be wrapping up my look at one-hit wonders of the '90s with a look at the years 1995 to 1999 and a list of that decade's two-hit wonders. Gavin, like you, Prince is a bit of a hit and miss with me. Some singles I love and some I don't. I only own one Prince album and that's 'Diamonds & Pearls' which I think is absolute brilliance in its time and still today. I didn't mind 'Batdance' when it came out and it sounded like nothing I had heard before, I think which made it a big hit and of course because it was Prince. I can't listen to it today, cause it just sounds dated and awful. I much prefer getting my batman groove from the Crime Fighters Inc. single (LoL), which I think should be entering the Top 50 in a few weeks to come. I don't know why Mushroom didn't do a sly and purchase copies of 'Bedroom Eyes' out of their own pocket. Hey, I would if it meant getting the artist from the No.2 to No.1 spot after weeks of sitting at No.2. I wonder what was the difference in sales of copies with The Look & Bedroom Eyes? Mushroom should have done some promotion to make it spill into the No.1 spot. Perhaps buy the single and you can go into the draw to meet Kate or play attend an intimate concert including you and a handful of friends. I loathe 'Say Goodbye'. The video just had pretty boy band all over it. However, I thought the follow up 'Tell Me Something' was a great single, and I started to respect them a bit more. I also liked 'Kiss Me' & 'Indio' from '92. I remember the Indecent Obsession album cover or was it the shots in Smash Hits magazine?, them posing on the beach in their wetsuits half hanging off or something like that. When I heard Neneh's 'Manchild', I thought it was going to be a huge hit and bigger than 'Buffalo Stance', but yeah, I think you're right, Neneh was a little too ahead of her time in Australia. Sometimes I wish I was living in the UK in the late 80's and enjoying the hits rather than their misses in Australia. Lastly, wasn't there some sort of connection between Prince and Jenny Morris? From what I can vaguely remember, Prince loved the track and I think Jenny performed it somewhere with him in the audience. Yes, I know I sound very vague or off the track, but something like that. Yeah, the Indecent Obsession album cover was pretty horrendous. It was repackaged with a different cover for US release, since Tell Me Something had some minor success there. Jenny Morris supported Prince in the UK because he liked that single. An exciting week for Breakers (for some of us), with 4 of the 5 not cracking the top 50. Julian Lennon's 'You're the One' was one I wanted to ask ARIA about, too. I think I posted here before that I waited weeks and weeks on end for Neneh Cherry's 'Manchild' to crack the top 50, so that I could get a recording of the full video from Rage. Of course, that wasn't to be. Then the same thing happened with 'Kisses On the Wind', 'I've Got You Under My Skin' and 'Money Love'. Countdown Revolution had started by this point in 1989, and I have a vivid (though possibly slightly inaccurate) recollection of 'Saved Me' being mentioned as a 'chartbuster' this week - or at least its rise on the chart was mentioned by one of the hosts during the intro to the video. It rose from #73 to #50 from memory - I thought I had it written down in an old chart book, but I can't find it. It was definitely in the 70's though the week before. Anyway, this was possibly the first time I had confirmation that the ARIA chart went below #50, and I wondered where on earth you could find this information. 'Saved Me' was quite a brave first single from an album. It sounded to me like Prince had written it. Indecent Obsession was quite a strange name for a band aimed (whether intentionally or otherwise) at teenage girls. 'Batdance' was clearly a hit only because of the Batman tie-in. I went to see the movie with my sister during the school holidays. I remember thinking as it screened, ''there's no plot'. Pure hype over substance. I just had another look in my 1989 chart book, and one thing I've noted on next week's chart (spoiler alert! ), from its airing as a chartbuster on Countdown Revolution, is that 'Funky Cold Medina' was #54 this week. That must mean that Brother Beyond's 'He Ain't No Competition' was at #53 (its peak), and Debbie Byrne's 'Nature's Lament' was at #52 (also its peak) this week. The story I remember about Prince and Jenny Morris is that Jenny Morris was the supporting act for one of Princes concerts. Jenny was performing on stage and she happened to look offstage only to see Prince had plugged himself into an amp and proceeded to jam with the song. I still like to listen to Prince's 'Batdance'. Much prefer the longer version which has the faster tempo music at the end of the song. Personally I think his next single 'Partyman' is a better song. I'm glad you guys sorted out the Jenny Morris thing on your own! I only noticed a connection when I saw she'd supported him on tour doing my research for this post. Just had a look at the 7/7/1989 episode of Countdown Revolution (re-aired on rage during retro month 2012), and Inner City's 'Ain't Nobody' was announced as being #82 this week, 3 weeks after its appearance as a Breaker. W.A.S.P. 's 'The Real Me' (which missed the AMR top 100) was announced as being at #89, and Wa Wa Nee's 'I Want You' was announced as being at #74 (with the 'Blush' album at #61) on the same episode. I don't see why Batdance is despised upon so much. I think it's one of Prince's best songs. Prince was brilliant in composing his music & the beat is bloody catchy IMO. It's like a 3 part song. Partyman is also one I really like & he had plenty of others hits I enjoyed listening too. 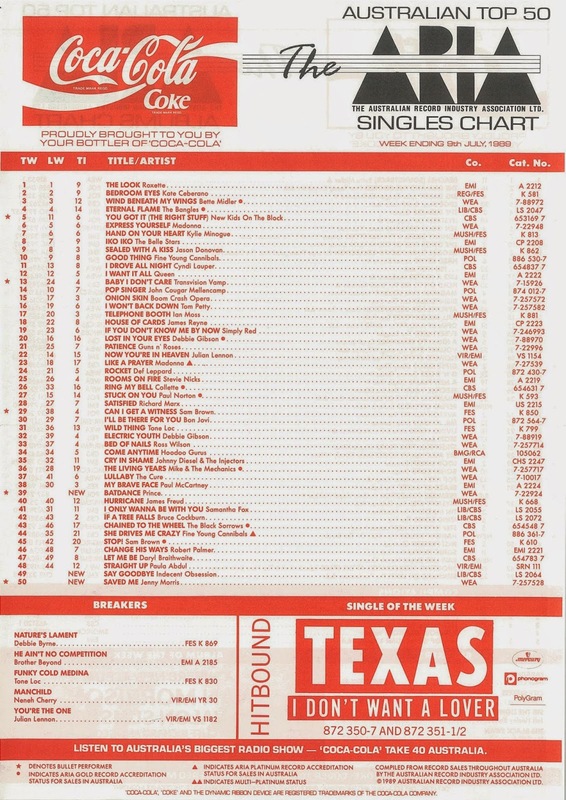 I distinctly remember this chart because it marked the first occasion on which I actually owned the 7" of every single in the Top 10 (I actually owned the Top 11). "Pop Singer" had prevented me from reaching that benchmark the week before, so I was pleased to see it drop out and be replaced by something I'd already bought a few weeks earlier.